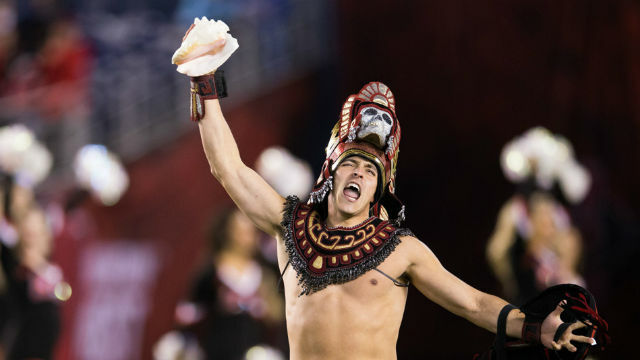 The Aztec Warrior cheers moments before a game in 2014. As its football team is preparing for the bowl game against Army in Texas, San Diego State signed what is believed to be the largest class of local talents Wednesday, the first day of the early-signing period. Out of the 16 student-athletes who signed letters of intent with SDSU on Wednesday, nine were from San Diego-area schools. That’s a win for Tony White, the Aztecs’ recruiting coordinator and cornerback coach. While his team was practicing at Burleson Centennial High School in Texas, White was busy checking his phone for signed commitment letters — so much so that he was afraid that head coach Rocky Long might get angry. Only time will tell if the recruiting class will work out as expected but SDSU signed some solid local talent, which is the goal every year, but this year it seemed to pay off. Having three back-to-back winning seasons, certainly, did not hurt. The key to SDSU’s success this year was recruiting local talent early before the Power 5 schools could get their hands on them. “I think the staff did a great job identifying the talent … and building the relationships needed to where when those guys get offer other places, I think the young men were honed in on San Diego State and what we’re doing and what we’re building here,” White said. And the number of local talents are expected to grow over the next two days of the early signing period and Feb. 7, when traditional commitment begins. Long said he’s understands why local players want to go elsewhere. It’s a chance for them to go stretch their wings away from their parents and “become their own man,” he said. “But we’re happy … that a lot of the guys we offered are staying in town,” Long said. In addition, the members of the early class include three from Nevada, two from New Mexico, and one apiece from Texas and Canada.